Those searching for a double door refrigerator with antibacterial and anti-odor technology can look no further than Whirlpool Frost free double door refrigerators. These fridges are less labor-intensive than the alternatives because they do not require the manual defrosting and cleaning that a direct cool refrigerator does. This cuts down on the upkeep and potential for leaks should one lose power. The Whirlpool Frost free double door refrigerators also include features such as a deodorizer, adjustable rack, fruit crisper, vegetable door, egg tray, and toughened glass shelves to store your food without breaking safely. Many features include water dispensers and ice makers for an additional cost. Colours run in red, blue, black, white, or stainless steel. Find below the full list of 48 Whirlpool Frost free double door refrigerators, last updated on 23rd April 2019. 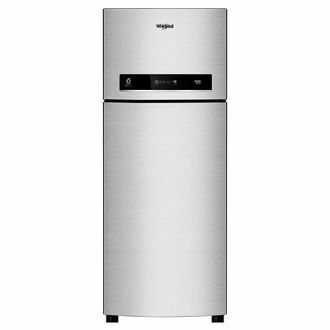 Whirlpool Frost free double door refrigerators are available online at the lowest prices. Buying online can save the hassle of arranging delivery, installation, and researching products, as we include all of these options on individual product pages for your use. Choosing the best appliance for your kitchen is essential, especially one as important as a refrigerator. Whirlpool Frost free double door refrigerators are made with incredible craftsmanship, with a brand name and warranty to back up this quality work. Find the lowest prices here.